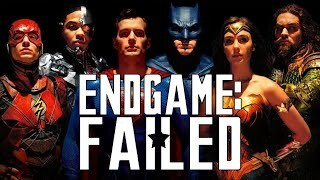 After decades of zombie movies hitting theaters (or going direct-to-video,) along with numerous video games, comic books, novels and one hit TV show, we've certainly had an ample sampling of what is good (and not so good) in the genre. After seemingly claiming the crown as king of zombies, I'd like to argue why George Romero did NOT make the best zombie movie(s) ever with his filmography but rather it was Dan O'Bannon's "The Return of the Living Dead." Quick....think of the first word that enters your mind when I say zombie. If that word is "Brains!" then you're beginning to see the bigger picture. George A. Romero is rightly crowned the father of zombie cinema. 1968's "Night of the Living Dead" changed everything for horror movies and that effect is still felt today but in a far more watered down form. Romero topped himself with his sequel, "Dawn of the Dead" in 1978 which many considered the pinnacle of the genre. However by 1985 the slow, lumbering image of a zombie had ceased to appeal to anyone outside of die hard gorehounds. Something needed to come along and revitalize this classic movie monster as Romero's second sequel, "Day of the Dead," had floundered at the box office. Ironically it was a former partner of Romero's who would set that in motion. John Russo, in his split with Romero (and after some legal wrangling) had acquired the rights to use the words "living dead" for his own zombie films. Now without going into maddening details, eventually he wrote "The Return of the Living Dead" as a novel then adapted it into a screenplay. What Russo originally envisioned and what eventually ended up on film are quite different. Russo's work hewed very closely to Romero's vision of the undead and for Dan O'Bannon, this simply would not do. A master screenwriter himself, O'Bannon felt he had to be as different from Romero's work as possible (though still giving "Night of the Living Dead" it's due with a knowing wink.) As Russo fell out of the picture and original director Tobe Hooper left the project, the film landed in the hands of O'Bannon and he set out to completely re-vamp a horror staple as not just the writer but director as well. With bleak, dark humor and a simple one word catchphrase, O'Bannon redefined what it was to be a zombie and it's influence on pop culture is somewhat staggering though there is some frustration in knowing that he was never really given the credit he deserved. Social commentary within our entertainment can be enlightening and also a nice subtle way of making us think about the world around us. Sometimes it gets a bit too preachy or heavy handed and begins to distract from the show. To his credit, Romero had things he wanted to say, a point to make and used the zombie apocalypse as his canvas. This is what elevated his work in the oft derided genre of horror but he would slather things on a bit thick. His "Dawn of the Dead" as some anti-consumerist screed perhaps would've worked better in the 1980s rather than the late 70s but that's neither here nor there. Romero's zombies were still the slow, dim witted threats they've always been with only the "message" differing from sequel to sequel. Of course there's always the old faithful idea that it's the other humans that offer up a bigger threat (as AMC's "The Walking Dead" still clings to.) Simply put, zombies were beyond stale and Romero wasn't doing himself or the sub-genre any favors by sticking to a formula. As 1985 rolled around, Romero unleashed "Day of the Dead" and while the special effects make-up still stands up to today's best work, the blueprint remained the same and the film contained some of the most unlikeable characters ever to see the light of day on cinema screens. "Day" died a quick death and Romero himself put the bullet into it's brain. That same year finally saw the debut of "The Return of the Living Dead" (after some legal threats from Romero's side were dealt with) and brought about an all together new zombie. One we had never seen on screen before, a more terrifying and unstoppable movie monster that was the only logical evolution from Romero's creations. Just how scary is a zombie that you can scamper up to, stick a pencil in it's eye, enjoy a cool beverage and skip away from the confrontation without so much as a hair out of place? I mean really, unless you were dumb enough to get yourself cornered by 50 Romero zombies, you had a pretty good chance of surviving the zombie apocalypse. Now imagine a zombie that not only runs after you but is smart enough to figure out a way to get at you even if you're enclosed in a "safe" area, one that is psychologically torturing you by telling you what it's going to eat (yep, brains) and the ONLY way to destroy it is by completely turning it into ash. Which zombie is likely to cause you more problems? That is what Dan O'Bannon unleashed on the horror genre. A genuinely threatening, scary zombie. There's no Bub to be domesticated. A shot to the head will simply not suffice. Unless you have a nuclear bomb handy, you're probably going to have a bad day. "The Return of the Living Dead" was exactly the kickstart that the sub-genre needed and what has kept the idea of zombies as cool as they are to this day. Of course there will be some who point to films like "28 Days Later" or the "Dawn of the Dead" re-make as the starting point of when zombies became more of a threat. These people are usually from a generation that wasn't born when "The Return of the Living Dead" was released.....that or they simply have very limited knowledge of horror films in general (and let's state this once and for all, "28 Days Later" did NOT feature zombies.) Another aspect that set apart O'Bannon's screenplay from the rest was the jet black and referential humor. Horror and humor has rarely ever worked and you would be hard pressed to name more than a hand full that managed to mingle both well without leaning too heavily in favor of one over the other. "Evil Dead II" is a prime example though it's humor did veer into slapstick, "Three Stooges" territory. Some 10 years before Wes Craven's "Scream," Dan O'Bannon crafted a film that referred to, poked fun at and paid tribute to what came before. 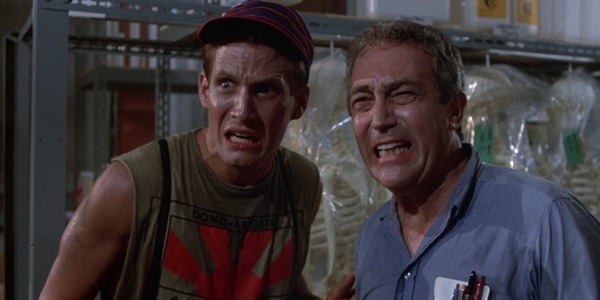 Playing the character of Frank, James Karen is having a bit of fun with the young new employee at the UNEEDA Medical Supply Warehouse, he tells him there's a cadaver in the basement and begins to craft a story to both enthrall and scare the younger man. In doing this he refers directly to "Night of the Living Dead" by saying it was based on a true story but that the movie "changed all the facts around" so the filmmakers wouldn't get sued. A simple twist to move this story forward to be sure but one that works very well in establishing a new self-referential tone for the genre. By playing with conventions, O'Bannon makes a very bold statement - "This is different." Even in more subtle ways that perhaps some of the audience never quite picked up on. When Frank, Freddy and Burt encounter their first reanimated corpse in the warehouse, they think by destroying the brain they will kill it because we are all familiar with the rules set up by Romero. When that fails the following dialogue is exchanged; Burt: I thought you said if we destroyed the brain it'd die Frank: It worked in the movie!!!!! Burt: Well it ain't working now Frank! Freddy: You mean the movie lied?!?!?! Granted the joke is obvious but one that's never been made before. The more subtle aspects come with locations. A quick example would be that the living lock themselves away in a funeral home, a place for the dead while the zombies roam around in the land of the living. The swapping of locations give the story a unique twist. The right soundtrack can, at times, make or break a movie. Watching films made in the 80s today can feel terribly dated because they end up using a synth score (as classic and beloved as something like "Blade Runner" is, I can't help but notice that horrendous synthetic score. A futuristic story shouldn't feel dated.) 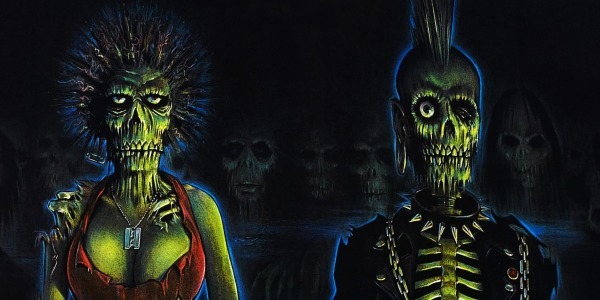 "The Return of the Living Dead" didn't feature much of a traditional score (synth or orchestral other than the "Trioxin Theme" which sadly has never seen any kind of official release on CD) but opted for a punk rock soundtrack from several great underground punk bands like The Cramps. This anti-establishment mindset further adds to the idea that "The Return of the Living Dead" was fighting against the norm, setting itself apart from the rest and giving the old school the middle finger. Many of the characters in the film (primarily the kids) were punks/mods themselves so it's not as if this was an odd choice. (I would imagine that if the film were remade today, the producers would change the punks into goths since that's a bit more current not to mention that goths seem to have more of an obsession with death and gloom.) Songs like "Surfin Dead" and "Take A Walk" add a sense of urgency and thrill that you simply don't get when the drone of a 70s synthesizer plays on in the background. 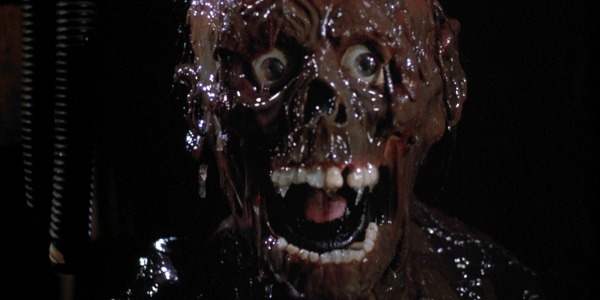 For one to truly appreciate how much of a gamechanger "The Return of the Living Dead" was and is, one only needs to examine pop culture itself. You barely have to scratch the surface to see it's influence. Dan O'Bannon doesn't need to be namedropped (nor does the film) to instantly know how different the zombie landscape is in the 21st century. Outside of "The Walking Dead," almost every reference or use of zombie culture can now be traced back to O'Bannon's work. Almost every time you read an article, movie review of the latest zombie flick, see some T-shirt at your local Hot Topic, etc, there is some joke or statement incorporating "BRRRAAIIINNNSSSS!!!" into it. Zombies are no longer flesh eaters but brain eaters. This is a fundamental change in how people think of zombies. It'd be like a vampire movie completely altering how we view those creatures and now think of them as monsters who crave spinal fluid rather than blood. These days there is still an ongoing debate about "fast vs slow" zombies with horror fans hotly debating which are better. Obviously Romero himself has a preference, calling fast zombies "unrealistic" which is somewhat humorous considering we're talking about fictional monsters (bath salt rampages notwithstanding.) Of course it's rather ironic that in the remake of Romero's classic "Dawn of the Dead," his zombies were replaced by O'Bannon's and thanks to the success of that remake, not only was the zombie movie made financially viable again, Romero was able to land his first studio film in many years, "Land of the Dead" (which promptly died at the box office because he offered up nothing new. Now he's been relegated to the direct-to-video bin for the rest of his career.) In 1985 "Return" squared off against "Day" in theaters with approximately a month in-between opening weekends. Audiences clearly picked their favorite as "Return" opened to $4 million and ended with almost $15 million (which doesn't sound like a lot in 2013 but back then that was a lot especially for a small budget film.) In comparison, "Day" opened to less than $2 million and finished with roughly $5 million total. Now I understand you simply cannot factor in numbers alone because popularity in and of itself is not a barometer for quality which is why I have spent the majority of this article talking about other aspects (influence, etc.) Dan O'Bannon gave the world some enduring pieces of entertainment, "Alien" wouldn't have existed without him for pete's sake. His HP Lovecraft adaptation, "The Resurrected," is an underrated gem which many call the best Lovecraft film ever. In between those two benchmarks was arguably his masterpiece, "The Return of the Living Dead." He didn't follow in anyone's footsteps but instead chose to blaze an entirely new path in a well worn genre. Even with lazy journalists using "28 Days Later" as the reference point for fast zombies (which is wrong on so many levels,) the shadow cast by O'Bannon's zombies still looms over cinema and even television such as when the series "South Park" had an episode featuring zombies - while they shambled like traditional zombies (well, shambled as good as 2D cut-outs CAN shamble) they STILL moaned for "brains." The mainstream media can refer to Wes Craven's "Scream" films as the first to parody and break down horror but "The Return of the Living Dead" already did that 10 years earlier. Dan O'Bannon's now classic zombie movie (forget the "cult" bit) is an ironic, horrific and witty take on established lore. A landmark film that shattered a horror genre and reassembled it in it's own image. Michael spends far too much time watching movies and upgrading his ridiculously large DVD collection to Blu-Ray. He has returned to writing with the hope that one day he'll get paid for doing something he enjoys rather than watching a clock and praying for the weekend to arrive.